Malie Organics. Beauty from Kauai. I was on a mission to get the Cinnamon Knuckles at the Kalaheo Bakery while we were in Kauai. I researched food as much as I did beaches before our trip, and read about these famous Cinnamon Knuckles (a cross between a croissant and a cinnamon roll) enough times to know we had to eat one, or two, and maybe even go back the next day for more. Needless to say I was pleasantly surprised when I discovered that Malie Kauai is Kalaheo Bakery’s neighbor. 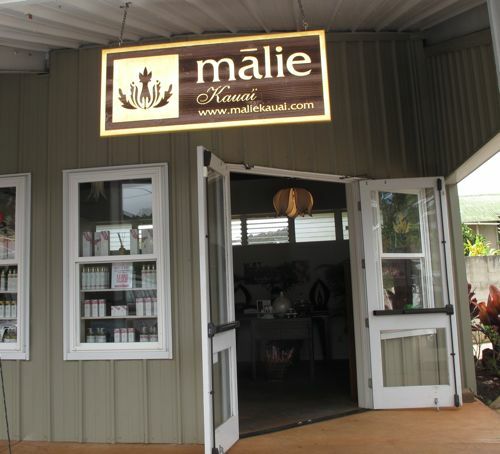 Malie Kauai is a body and skincare line that uses indigenous Hawaiian botanicals and a high percentage of organics in many of their products. As with all beauty lines though, you need to read ingredient labels if you are looking for 100% natural ingredients. It appears that about half of Malie’s line is all natural which includes their Organic Mango Butter Bun, Organic Facial Tonic, Organic Body Polish, and Organic Beauty Oil. Their soaps and body cream contain phenoxyethanol a questionable preservative as well as PEGs which are derived from petroleum. On their website, they state there is “no petroleum” in their products. This is technically accurate, but petroleum is a part of the process in making PEGs. While I wish Malie’s verbiage were more straightforward, I’m not trying to berate them here. I just want to be clear that not everyone is going to consider the line entirely clean. I was given samples of their new Anti-Aging Firming Elasticity Cream during my visit to the boutique and I began using the cream before I read the ingredients closely. Ignorance is bliss sometimes isn’t it? So now I am in a bit of a quandary, as I really, really like this cream. It features Hawaiian coffee fruit extract, a cranberry looking fruit that has potent anti-oxidant acids like chlorogenic acid (anti-inflammatory properties), caffeic acid (anti-inflammatory properties), ferulic acid (reacts against free radicals and repairs cell damage), quinic acid (anti-viral and anti-bacterial properties), and trigonelline (anti-bacertial properties to cleanse, minimize blemishes and even skin tone). Organic aloe vera (the first listed ingredient instead of water), organic jojoba oil and organic shea butter add nourishment and hydration to the coffee fruit actions, creating a potent night cream. This is not a creamy cream. Its thick like a cream, but sinks into the skin immediately leaving no trace of dewiness. Yet, when I wake up, my skin feels very hydrated and my skin tone has become more even after using it for a couple weeks. There are no PEGs in this cream, but phenoxyethanol and chlorophenesin leave me uncertain, even though they are the last ingredients listed. I have fallen for another Malie product which is 100% natural and organic, the Jasmine Rose Beauty Oil. This is one gorgeous body oil. It’s made from organic coconut oil, organic jojoba oil, organic apricot kernel oil, and organic grapeseed oil so it’s a wonderful moisturizer, especially after a shower when your skin is still damp. The scent is from organic jasmine oil and organic rose oil which sounds simple enough, but the blend of these essences could not have been better proportioned in my opinion. When the Jasmine Rose Beauty Oil first touches the skin, a mildly indolic but very fresh jasmine scent is apparent. Soft petals of rose become more pronounced making this scent more rose than jasmine. Jasmine’s fullness remains present, but I would consider this one of the prettiest rose fragrances I have ever smelled. No deliberating on this one, I love it and will buy it again. Disclosure: Samples of the Anti-Aging Cream were given to me with my purchase of the Beauty Oil. The opinons in this review are my own. I was not financially compensated for this review or any other. Sounds wonderful. The summer season one does end up changing the moisturizers and facial care. You must be very relaxed from the influence of the tropical paradise. It’s true, I’m not going to need such a creamy nighttime moisturizer as the weather gets warmer. This Malie one will be perfect. And yes, I have very relaxing, beautiful memories of Kauai. That body oil sounds so gorgeous. What a nice souvenir to remind you of your relaxing vacation every time you put it on! Kauai was gorgeous and I’m glad to have Malie’s body oil from that trip.